I grew up vacationing in Wilmington, North Carolina (I even briefly contemplated attending college there), however it has been almost two decades since I last visited and I could not wait to experience this beautiful beach town along with my husband and son. We thought it was the perfect destination for our mini-spring break weekend getaway. Wilmington is less than a four hour car ride from Charlotte, North Carolina. Since we wanted as much time as possible there, we decided that our son should play hooky from school on the Friday we left. Since we arrived too early to check into our hotel, our first stop was at the Wilmington Railroad Museum. On a side note: the Visitor Information Center is literally next store in case you are in need of advice about the city and the surrounding area. If you are traveling with children, then you must go to the Wilmington Railroad Museum. I promise you and they will love it! Your first stop is where you purchase the tickets and begin to view authentic souvenirs from the railroad days. Be sure to check out all of the unique things they offer at the gift shop. Then it is onto the exhibitions, which present an abundance of information and artifacts about the history of the railroad and the people who made it run. Learn about how the railroads were developed with highlights on engineers, conductors, women, service staff, and more. Sidebar displays offer insight on railroad heritage and lore, including some surprises about how railroads influenced life today. Our son’s favorite part of the museum was the Children’s Hall. 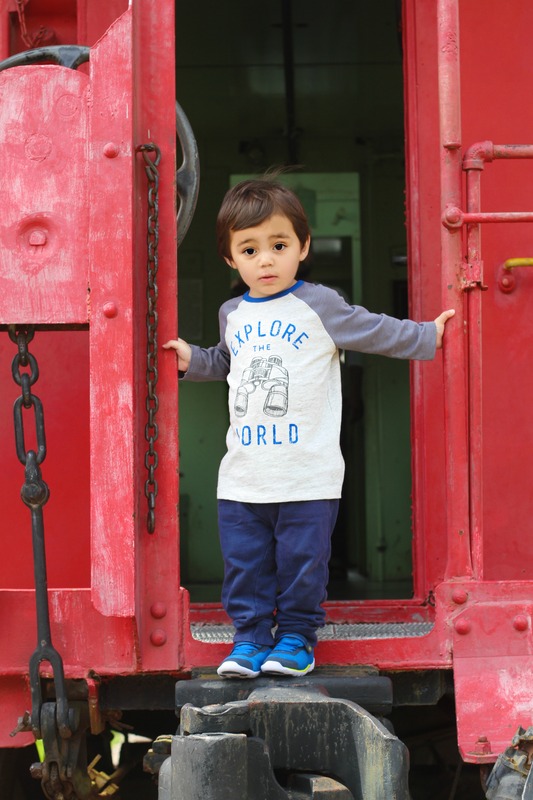 For the youngest visitors, this area is where kids exercise their imaginations and play with toy trains, climb inside a child size caboose, and view the lively action of trains on a large-scale layout. If we did not have plans for the rest of the day, Joaquín would have spent hours playing there. Next up is the Marvel Hall. The intricate and painstaking construction on this 1,500 square foot layout has spectacular examples of model building skill. It is the largest museum layout in the Southeast! Parked right outside the museum are the biggest artifacts. There is a locomotive, a boxcar, and a centuries old caboose that you can walk/play inside. Year round the Wilmington Railroad Museum offers story time, caboose parties, after-hour rentals, and there are always fun extravaganzas during the holidays. As previously mentioned, we could have definitely stayed longer, but we were too excited to see the ocean. . .
Lovely photos! Joaquín is so cute!!! Thank you so much to both compliments!!! Seriously your writing and photography makes me want to visit Wilmington TOMORROW!!!! Wow what an awesome compliment, thanks!